Week 8 Waiver Wire Picks: Marlon Mack, Lead Back? The waiver wire is about to open up and it's time to make your picks. Injuries continue to ravage starters, but which backups are worth a roster spot? Are any rookies getting ready to make their mark? These are some of the questions that will be addressed in the week 8 waiver wire picks. The Jets are not looking too bad and McCown actually resembles an NFL quarterback. He has produced at times throughout his career so some value is not unheard of. Two of his next three matchups are against the Falcons and Buccaneers, so McCown's production should continue in the short term at least. He has scored over 15 fantasy points in 5 of the last 6 games. He is a surprisingly good option at quarterback. Outside of a marquee matchup, Brissett is not going to win a week for you. He is also not going to cost you a win though. He is a good player with a solid floor and that is worth something. In 6 weeks as a starter, Brissett has not failed to score double digit fantasy points. He has topped 20 points once, scoring 30 in one of those games. As an every week starter, this is not an ideal fit. Still, Andrew Luck very well may not play this season so Brissett has ROS value. Two Colts players in the waiver wire picks, the apocalypse is nigh. Mack has looked great all season, but he has not gotten the carries for some reason. Last week he finally out-touched Frank Gore and hopefully things are trending in that direction. There is plenty of upside with Mack as he has explosiveness to spare. If he retains the heavy end of the touches for Indy, Mack could be a fantasy hero down the stretch. The Eagles are splitting carries with Smallwood and Legarrette Blount. The way that their offense is playing, both backs have some value. Smallwood is certainly more explosive and he will see all of the passing down work. Most game scripts favor starting Smallwood in standard and PPR leagues. Blount's main utility if for the Eagles killing clock at the end of games. I like Smallwood going forward and especially in the Eagles' next game versus the 49ers. 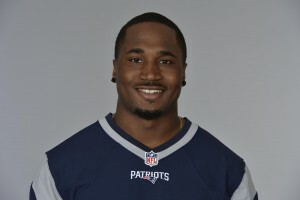 The top back for the Patriots right now is Dion Lewis, go get him. The Pats backfield is a committee and that is not going to change. One thing is for certain though, Belichick recognizes that a healthy Dion Lewis is his most explosive running back. There have been two games in a row where Lewis got double digit carries. He has been trending up since week 3, garnering 2, 4, 7 11 and 13 carries respectively. There is no sure thing when it comes to the Pats rushing tendencies, but Dion Lewis is close. The Niners have reduced the presence of Breida in the lineup lately. There have also been some pretty strong rumblings of trying to trade Carlos Hyde. It stands to reason that the team may be showcasing Hyde for potential trade partners. Grab Breida and hang onto him at least up to the trade deadline. Certainly do not start him now, but he could be the starting back in a couple of weeks. The Saints seemingly have a lot of receiving weapons, but Ginn has worked his way to a decent role. He has double digit fantasy points in three of the last four games. There has been an uptick in usage as well; Ginn's catches have gone 2, 4 and 7 over the last three games. When/if Willie Snead can get back and play well it may eat into Ginn's touches. For the time being, he is a major option in a good offense. The Bills had a plus matchup on offense last week, but Matthews did nothing. Do not let this discourage you from picking up the only pro-caliber receiver on the Bills roster. A finger splint and plenty of discomfort led to a quiet day for Matthews against the Buccaneers. Still, he should see a preposterous amount of volume going forward. If he can get on the same page with Tyrod Taylor, then he should see as many targets as anyone in the league down the stretch. I've been a big fan of Kupp, but Woods is solid in his own right. The Rams passing game is humming along and it runs through these two receivers. Sammy Watkins is an afterthought or at best a decoy at the moment. 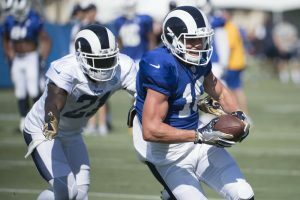 Woods and Kupp are seeing a robust volume of targets and that makes them worth a roster spot in most leagues. There will not be a ton of touchdowns with these guys, but the opportunities are there. 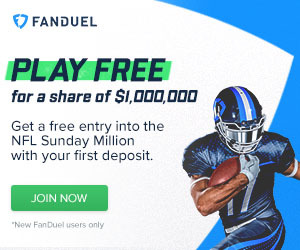 It goes without saying that in PPR leagues they are significantly more valuable. The Steelers are keeping Martavis Bryant in the dog house and Smith-Schuster continues to impress. The rookie from USC is not putting up huge numbers, but he is an important part of the Steelers passing game. For the remainder of the season, he is probably just a flex option. He is a good flex option, though. The Titans flashy rookie receiver is almost ready to return to game action. There is a bye week for the Titans next week, which should give Davis the time he needs to get back on the field. This is an upside play and he probably should not be started immediately. There is as much potential for Davis to win matchups as with any young receiver this season, however. The Bucs have two very good tight ends in Howard and Cameron Brate. It depends on the week which player goes off, but Howard is the most recent. He certainly has the brighter future as Tampa spent a high pick to acquire his services. If Howard continues to attract the attention of Jameis Winston, he could be in top-5 tight end territory. He needs to prove that he can do it every week before he is more than a TE2 though. Being the starting tight end for the Bengals provides solid fantasy value. Kroft is certainly not as talented as Tyler Effect, but he is seeing good volume. Kroft is averaging over 4 receptions per game since taking over as the starter. He has also scored three times already. There are not going to be many big gainers with Kroft manning the position, but he has a seemingly stable floor. You could do a lot worse at a very volatile position. As a nice bonus, he get the Colts next week. Check back tomorrow for the top upside picks of week 8. As always, check us out on Twitter for more insight and analysis: @_knuckleheads and @brendancole16. Category - The Best Waiver Wire Picks - Week 8 Waiver Wire Picks: Marlon Mack, Lead Back?